Best View in Brooklyn: Zum Geburtstag Viel Gluck, Papi! Zum Geburtstag Viel Gluck, Papi! My dad is 75 today. Amazing. Partly amazing because I don't think of myself as someone old enough to have a parent who is 75, but there you go. One of my favorite stories/memories about my dad is that he melted his wedding ring in the chemistry lab. Looking at the weirdly shaped ring and hearing the story was always a treat for us. I also loved hearing about how the only time he really felt like punching someone was after my middle sister was born. My dad was asked if they were planning on giving me back (I'm adopted). He's a great dad, and a super-duper grandfather. His deep voice puts both of his grandchildren into a relaxed stupor. That's partly how I chose the poem for today. 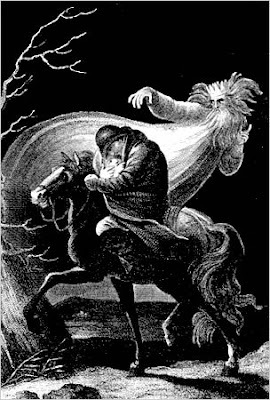 Goethe's "Erlkönig" is a popular poem for school children to memorize in Germany. Or it was. I remember my father reciting this poem to us, and I think we had a recording of it as well. It was very eerie. Being my righteous self, I was always angry that the father seemed to ignore his son's pleas to save him from the Erlking. Now, being a parent, I see that the father just wants to calm his son and keep him safe (while quelling his own worries) while they ride to the doctor's abode. This translation is not nearly as beautiful and haunting as the German, but it tells the story well enough. The link to the poem (see "Erlkönig" above) has some interesting ideas as to the origins of the poem, and it also guides an interested reader to other stories and connected literature. The illustration is by J. H. Ramberg. For the few locals that know German, I'll post in both German and English. (It's much more beautiful in German.) Happy Birthday, Papi! Wer reitet so spät durch Nacht und Wind? Who rides so late through the night and wind? Er faßt ihn sicher, er hält ihn warm. He holds him secure, he holds him warm. Siehst, Vater, du den Erlkönig nicht? Father, don't you see the Erlking? «Du liebes Kind, komm, geh mit mir! “You dear child, come along with me! «Willst, feiner Knabe, du mit mir gehn? “Won't you come along with me, my fine boy? Meine Töchter sollen dich warten schön; My daughters shall attend to you so nicely. Mein Vater, mein Vater, jetzt faßt er mich an! My father, my father, now he's grabbing hold of me! Er hält in Armen das ächzende Kind, He holds in (his) arms the moaning child. Erreicht den Hof mit Mühe und Not; He reaches the farmhouse with effort and urgency. In seinen Armen das Kind war tot. In his arms the child was dead.